Combine onion, garlic, ginger, sugar, soy, sesame oil and chili oil or hot sauce in a food processor fitted with the “S” blade. Pulse until the mixture forms a smooth, wet paste. Pour half of the marinade into a zip-top plastic bag. Add the beef, seal the bag and refrigerate for 4 hours or overnight. Combine the remaining marinade with the peanut butter and water in a small bowl. Set aside until ready to use, or cover and refrigerate overnight. When ready to serve, heat indoor or outdoor grill. 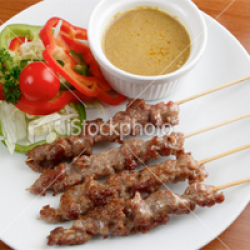 Thread the beef onto skewers and grill for 1-2 minutes per side, basting with the marinade once on each side. Serve immediately with the dipping sauce. Makes 8 appetizer servings or 4 entrée servings.